Stocking your gelateria with only the most delicious flavors of gelato is of the utmost importance if you are in the business of serving this classic treat of Italy. With a similar idea to Farm-to-Table, serving gelato that is “Italy-to-Table” can seem like a tricky feat when you are just starting out. Luckily, GS Gelato has a great passion for serving authentic Italian gelato for wholesale and private label buyers to ensure the gelato you serve has all of the creamy and indulgent flavors reminiscent of Italy. GS Gelato’s facility uses Italian equipment shipped to America to ensure that no shortcuts are taken when creating authentic gelato flavors for our customers. Whether you are interested in wholesale gelato or retail private label gelato opportunities, GS Gelato has a program that will fit your needs and help you to maximize your efforts. From start to finish, GS Gelato offers hundreds of authentic gelato flavors all the way to the gelato supplies you will need to serve this delicious treat. Serve your gelato with fun and reliable gelato supplies from gelato cups to sturdy scoops and gelato flavor tags. GS Gelato believes in creating gelato with a complete package. From the gelato supplies you use to serve your customers to the authentic gelato flavors created at their facilities, you will receive only the best when you choose GS Gelato for your wholesale and private label gelato needs. 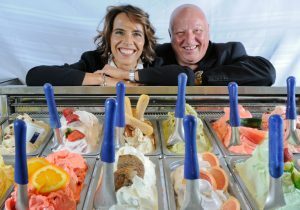 Gelato and sorbet for foodservice and retail (private label & co-packing). Made in the first-ever imported equipment and crafted with the best ingredients from around the world.